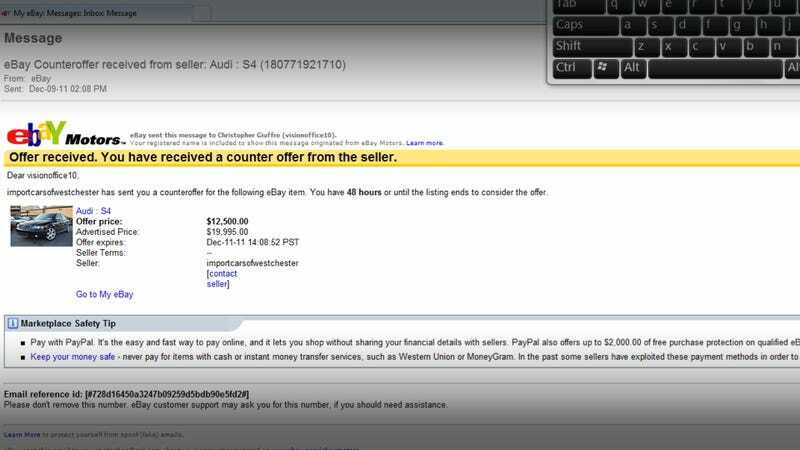 One apparently erroneous digit in an eBay classified listing for an Audi S4 has set off an online feud between a used car dealer in Pennsylvania and the car's would-be buyer. Both claim the other is being unreasonable and neither side seems willing to yield. Here's what happened. Let's start with what both sides agree happened. Independent used car dealer Import Cars of West Chester in West Chester, Pa. listed a 2005 Audi S4 on an eBay Motors classified page for $19,995. Christopher Giuffre of New Jersey made an offer of $12,500 for the vehicle. The dealership then countered with $12,500. Giuffre gladly accepted the offer. Five minutes later there was a call from a salesperson at the dealership stating that the counter-offer was a mistake, they meant to sell the car for $19,500. The salesperson apologized but said the car would not be sold for that amount. Here's where they stop agreeing on what happened. Giuffre says he thinks the dealership realized they shouldn't sell the car for that price and quickly changed their mind. Chris Albertson, manager of the dealership, says it was purely a mistake and that they did their best to correct it. They said they meant to counter with $19,500. "I don't see how the can make a mistake," says Giuffre, speculating that maybe they looked at the wrong car or a salesman shouldn't have sold it for that little. After the sale an automatically-generated form email was sent to Giuffre congratulating him on successfully purchasing the car. He then had his uncle, who is a lawyer, call the dealership and demand the car at that price. "My uncle called asking [about] what was going on and they basically just cursed him off," says Giuffre. "That's the only reason I'm taking it so far." Albertson says that the Uncle was the one who hung up on the phone call. "I would characterize [the call] as cordial at first and then it went downhill a little bit because he wasn't getting the answers he wanted," says Alberston. "He was not told to screw off." In Giuffre's view, the contract with eBay over the bid is binding. Albertson takes the opposite view. A representative for eBay Motors says that because it's a classified ad but not an auction that it is not a binding contract in their view and that, since the dealership says it was just a single digit mistake that was quickly rectified it's unlikely the dealership would be penalized for their mistake, although they are still looking into the details. After getting nowhere on the phone, Giuffre posted about the issue over on the Motor Trend forums, where the publication has apparently gone out of their way to ignore it. The actual value of the car itself is also a topic of debate, with Giuffre believing the price the dealership paid was closer to $13,000 and Albertson claiming that number is ridiculous because they aren't marking up the car by $7,000. Posting as "S4Man" on the eBay forums, Giuffre did admit he thought the car was worth at least $20,000. "Do we shoot ourselves in the foot to make him happy?" Albertson asks referring to that posting. "He's trying to be a bully to get us to sell him a car that's worth $8,000 more than what he says it's worth." Unlike previous eBay Motor auctions gone wrong where the Internet justice machine got the dealer to relent, this is an independent dealer not affiliated with a manufacturer so there are fewer levers to pull. Also, the dealer in this case has been willing to take with the media and answer all questions because he firmly believes he's in the right. Because neither side is yielding, resolution seems far away.